Download the Standard Edition of dhtmlxVault 1.7 (available under GNU GPL) or buy the PRO Edition. The additional feature of the PRO Edition is progress bar that shows the upload process. Be nice if they fix the c:\FakePath\ problem. It works fine in Firefox, Safari, Chrome and Opera but with IE 9 or higher every path shows up with c:\Fakepath\. This is getting to the point where I should just stop using your tool because first it was no IE 9 or higher support for over a year, now this! Sorry, but what exactly is wrong with this path? c:\FakePath is not the path for the file. Even a custom .php files on the server doesn’t fix that. It only shows up with IE not any other browser. 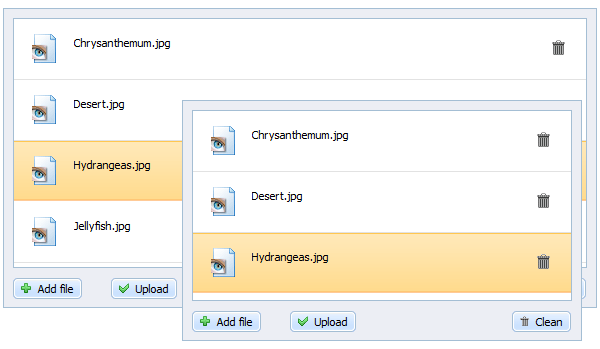 This is how IE browser represents the file path, what can be done here. No, you are wrong. It is how IE masks the real user’s path, actually it is the right thing – the server should not know the full path, it is a browser security vulnerability. Please check the code if you like or try a simple file input. You will get the same result. But why do you need the actual path? No I don’t need the path. It isn’t stored there on the server. It doesn’t do it in any other browser it just sends the file name which is what it should do. The server puts it where the php code moves the file to where it is suppose to be but when c:\FakePath\ comes in it doesn’t work. I am not going to use this if IE cannot handle it correctly. All other browsers don’t do this, they just send the file name. I still think it is a bug in dhtmlxVault. I have tried a simple file input box and it doesn’t show c:\FakePath\filename it just send to the server the filename. That example https://dhtmlx.com/docs/products/dhtmlxVault/samples/event_file_uploaded.html shows in the popup box is shows id: “2”, name: “c:\fakepath\filename”, uploaded: true/false, error: true/false. Firefox shows id: “1”, name: “filename”, uploaded: true/false, error: true/false and so does all browsers. When I use a simple input box and send the file that way it puts the name as just filename. dhtmlxVault puts c:\fakepath\filename as the filename. This is bug with dhtmlxVault not IE. I am sorry I made a mistake. I did try a input box again today and it does show c:\fakepath. You should put something in the documentation about that with IE browsers. I have never had an issue in the past before with this. All other browsers show just the filename which is all you need. I will have to fix my PHP code to filter out the c:\fakepath. Never had this happen before with IE browsers and a file input box. Just to be clear: it rendered as flat text, at the top, center on my page, pushing the other content down. It did not render as a floating “box”. Manny, please post your question to the corresponding thread in the forum (registration is free). This issue is not related to dhtmlxVault.